I'm gonna do something a little different this week for Friday Five. Instead of five questions, I am only going to ask you one. One VERY VERY VERY important life or death question. Are you ready? You can handle one question right? It's summertime and I am seeing them all over the place. Parks, malls, grocery stores, and yes even FANCY restaurants. 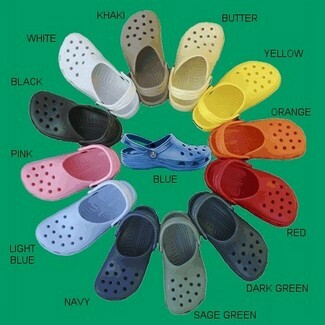 It seems as though when it comes to Crocs, people either LOVE THEM or HATE THEM. I want to know where YOU stand. I KNOW you have an opinion and I want to hear it. I won't be able to sleep at night until I know YOUR opinion. Kidding on the whole sleeping thing, it's the side sleeping that is killing me, but YES I want to know what YOU think of Crocs. I would LOVE to hear from my regular Friday Fivers AND anyone with an opinion about Crocs, most people DO have an opinion. Click BELOW to see whether or not I love them or hate them! Ok, no feelings can be hurt here, we are ALL entitled to our opinions but yeah I seem to fall into the DON'T REALLY CARE FOR THEM category. They are okay on little girls, but I don't really care for them on little boys or adults of any age. Not my thing I guess. Now BE HONEST, do you LOVE THEM OR HATE THEM? PS Yes, I do realize that Dooce has already covered this topic but damn it I want to hear from MY READERS! And since when does anyone own any blog topic?! She doesn't think that of herself but clearly some of her readers do. * Edited - I think my blog title is a little misleading, like I am currently thinking about getting some but I'm not sure. I know FOR SURE that I won't be getting any. They aren't for me. I want to post a quick hi and want to say my appriciate due to this good post. Those are indeed very comfortable. Great, this story really touching, beautiful new beginning the end of impressive. Thank you! This looks absolutely perfect. All these tinny details are made with lot of background knowledge. I like it a lot.i like reading your recipes. informative & loads of fun! Your blog is outstanding; do not a lot ofthings people are talking about intelligence. I am glad I have this chance in my relatingsome of the search.I like it. This is very good !!!!!!!!!!!!!!!!!!!!!! I know FOR SURE that I won't be getting any. They aren't for me. I’m positive my followers will find this article really useful. Writing is exceptional, I like your article that fresh soul, you read the article more attractive. Comfortably, the article is in reality the best on this valuable topic. I har monise with your North face and will thirstily look forward to your coming updates. Just saying thanks will not just , for the wonderful clarity in your writing. I will instantly North face outlet grab your rss feed to stay privy of any updates. Fabulous work and much success in your business dealings!